What Is I Ching Hexagram 12 All About? 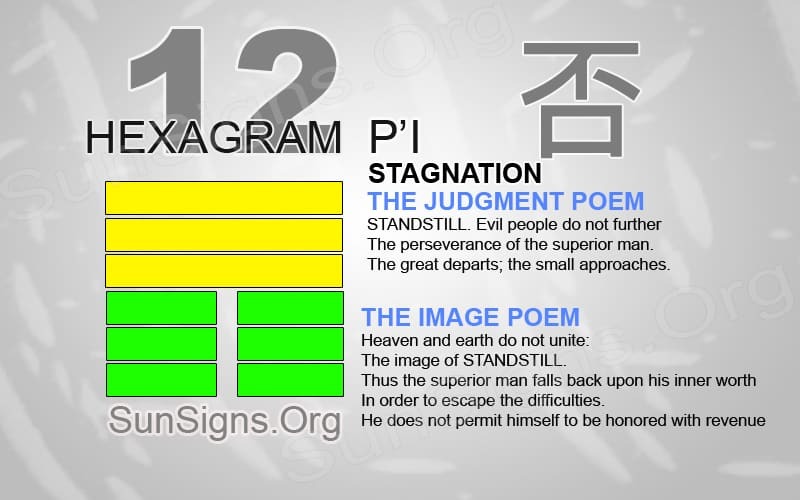 Hexagram 12 symbolizes a type of person instead of a period. Life itself might have stopped, and the feeling of frailty might have filled our inner feelings. But, Hexagram 12 shows us how to look at the people around us could move on from this still phase. Hexagram 12 represents a form of adversity that is caused by certain types of people that fill our lives. Examine many aspects of life to figure out where this obstruction could be coming from. Is there a new relationship that could be faltering or leading into a dark place? Business ventures that sound too good to be true could be dangerous. Many selfish people fill the world and are looking to make victim those with low self-esteem or are currently vulnerable. Hexagram 12 is a reminder that even when we face great adversity that this too will pass. It can sometimes be surprising to find out that those we care about don’t have our best interests in mind. That is why it is important to prepare against those that wish to do us wrong. We cannot avoid pain and hurt, but we can understand how to deal with those periods. It is sometimes hard to stand up for what we believe in. But by raising our confidence and respect in our morals, defending them and our actions becomes much easier to do. There will be times along the life path when we feel low and are at a standstill; unsure of what to do next. Thus, it is important to guard ourselves against the influence of others during this time. It is easy to allow others to make important decisions for ourselves. This happens when we are unsure of what direction to start walking in. It is during this time that we build ourselves up. Try to overcome others that might be working secretly to pull us deeper into the void of fragility. Now is the time to strengthen important social skills. Thus, it will help us to stand up to those who wish to oppose us. If you have any doubts about a current relationship, it is a good idea to end the relationship now than risk getting hurt in the future. Define your moral standards and work diligently to gain discipline towards these morals. During periods of uncomfortable stillness, there can often arise a business opportunity. It may appear to be able to fix many problems in personal life. This new position could include more hours or completing the type of work that is most enjoyable. Take the time to review the opportunity before you jump on board. It could be entrapping you in a lot of hard work that doesn’t pay off in the end. This new business may not have your best interests in mind. But, you will utilize your great skills without any giving any benefits. There is no shame in turning down a job offer that doesn’t sound right. Make sure the managers are willing to provide all the necessary information. There is never a time in our life that will last forever. And eventually, the course of events will change into a new period. Enduring to the end is what keeps the human heart beating to create a better change in the life path. Divert from the current path when it is dark and painful. This is an ability that takes a long time to obtain.